For those of you who were drawn by the first part of the title. Sadly, it is a little sensationalist draw for you. No, my secret James Bond-baddy style Dividend Drive bunker has not been discovered. Nor have I had an unfortunate wardrobe malfunction whilst holidaying across the Atlantic. So what has been exposed? Well, in this case it is portfolio exposure to a US-listed equity. Thanks to a little unexpected twist I now find myself with a holding on the New York Stock Exchange. So how have I dipped my toe in the world of US equities? Well, let's take a look. To be honest, this is a little late. On 1 May Catlin left my portfolio after its purchase by XL Group. In turn, some shares for XL dropped into my account. For those of you who are avid readers of this blog (there has to be one surely...no?...just me then), you may remember this was not originally going to be the case. Originally I had requested for a full cash return from the acquisition rather than one in which part payment was through XL shares. However, at the time this was on condition that it was no so oversubscribed that the cash was available. It appears that a large number of people requested the cash-only return as XL Group were unable to fully service this. 0.029865 in new XL Group shares. In total this meant that I have come away with £668.64 in cash and 3 shiny new New York-listed XL Group shares. For these reasons I will be keeping this tiny holding. However, there is another non-quantifiable reason for keeping hold onto this small holding: experimentation. I will be using this little holding as a tester for what it is like to hold and manage US-listed stocks in my current brokerage account. But, as I have a new holding in my portfolio, it is only fair it gets the usual treatment. 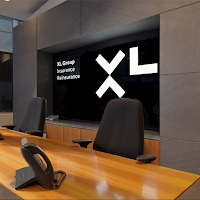 Why XL is an Attractive "Hold"
So let's take a look at XL as a company. I have taken the share price as it was on the morning of 1 May: $36.88. This is a pretty solid set of predictions. Not only are they fairly tight between the highest and lowest predictions but even taking the lowest we should see a PE at an excellent 12.3. Very sound indeed. This is--with all predictions--a marked shrinkage on EPS from last year though. Again, even assuming the lowest predictions we should see a very good value PE reading of under 12. Excellent. XL do pay a dividend. However, unlike its UK-listed peers it is relatively modest. Next year there is an anticipated dividend of $0.692 per share and $0.743 the year after. This would represent a small yield of 1.88% and 2.01%. Not huge, but not insignificant either. What is more, it is a mightily safe dividend. The 8% growth per year in dividend would still see the dividend covered over 4.5 times by earnings this year and nearly 5 times next. Quite some coverage! As such, this rate of dividend increase looks pretty sustainable over the long term. Amazingly, the stonking numbers look equally solid elsewhere. The debt-to-equity ratio is a wonderfully low 0.17. What is more, they have about $8.22 per share in cash. That is 22% of the share price in cash alone. Overall, this represents a very strong capital position. So where does this leave me? With 3 shares XL represents just around 0.3% of my entire portfolio. As such, its high beta (1.26), low yield and place in my already overweight sector of the financial sector will make little impact on my portfolio's structure and position regarding my goals. What is more, taking last years yield I should see my XL holding throwing out a frankly massive $1.92 (about £1.25) into my income pot each year. Of course, this mighty cash contribution will be affected by the currency conversion fees my broker charges on foreign currency payments. It may not be much, but it is a little shove towards my goal of £800 in dividend income this year. As they pay quarterly dividends--like most US dividend payers--I should see three further dividends before the end of 2015. Nice. Overall, an interesting if unexpected addition to my (now international!) portfolio. I find it grossly unfair that English companies list on the NYSE, and thus US citizens can take advantage of their own American tax federal options, whereas US companies do not bother to list on the London markets. The only way around the tac is if you but US shares in your SIPP, then you can avoid the tax, but apparently a lot of brokers do not even help you at this up. SAD. I have the W-8BEN all done and dusted on that front from earlier but thanks for the kindly reminder because I would have forgotten about that otherwise! In reality, I expect to make next to nothing in dividend income from my XL shares both due to their size, yield and listing status. But I am happy to hold nonetheless for now! I agree it is a little unfair. However, I guess US companies recognise that UK investors (and other nationalities) are happy to take on a little more difficulty in order to invest in the US because of their status as the biggest economy (and stable democracy and market). There is probably little to gain from listing here. Sad, I agree. But understandable from the perspective of the board of directors across the Atlantic! Yes, the SIPP matter is very annoying. When we were talking about SIPPs before I was tempted to open one as my "overseas investment vehicle" so to speak. I still may, but as you say they are inconsistent in how they handle the foreign tax benefits of pensions. I will keep prodding and poking until I fathom what best to do! Thanks again for the helpful comments as always! Haha, nice sensational headline! Good luck with these shares and your 'exposure'! Thanks, I do think that XL is an excellent company so I am quite happy to trot along with it through my little exposure! Ohh great, Very helpful.By going through the description, I can see the research behind the information. Thanks for sharing.